Imagine strolling along the pristine white sand of Lanikai Beach, consistently named one of the top 10 beaches in the world! Only a 5 minute drive from this stunning one-bedroom tropical oasis. Kailua Beach, a long and spectacular stretch where you can walk for miles, is even closer, just 2 minutes with plenty of parking. Pulling into this 10,000 square-foot property you’ll be surrounded by coconut trees, travellers palms, banana trees, heleconia flowers, a koi pond and many other native Hawaiian plants. Walking through the tropical gardens to your one-bedroom unit boasting 975 square feet of living space with a lanai (Hawaiian for porch) overlooking the sparkling salt-water pool & waterfall. A very peaceful and quiet location, with little road noise or traffic, sets the tone for relaxing in the wonderful outdoor chairs overlooking the pool with a sliding door to the kitchen and living area. Making it the perfect refuge to come home to after a long day exploring the island. Stepping into the unit you’ll be welcomed by stunning artwork, tropical décor and all the comforts of home. For guests that like to cook, you’ll have everything you need in the well-equipped kitchen: stove, fridge, microwave and even a shared BBQ. After a fun day in the Hawaiian sun, rest your head on a sublime King Bed in the perfect temperature of your air-conditioned room. For the tech lovers, this unit has 2 flat screen televisions, one in the bedroom and the other in the living room. Keep up with friends and family with free WiFi access. Find the perfect place to focus with a cozy work nook complete with desk and chair. Enjoy breakfast or evening drinks in the comfy chairs on your private lanai, unwind with your favorite book by the shared salt-water pool and melt away sore muscles in the bubbling hot tub. Grab any of our complimentary, fun beach items before you head out for the day: bicycles, beach chairs, boogie boards, umbrellas, lunch coolers and more. Plus, enjoy the convenience of a shared, fully-stocked laundry facility on-site and one off-street parking space...it’s all included! Book this one-bedroom unit and you’ll find yourself in the heart of paradise, and that includes shopping at some of the best boutiques on Oahu where you’ll find special apparel, jewelry, swim wear and home goods only found in Kailua. Foodies, you’re in the right place. Grab a coffee before your morning beach walk at the beach café. Enjoy healthy lunch options from Whole Foods, Aloha Salads or Grylt. Try Hawaiian shaved ice – pineapple, coconut or lilikoi flavors – at the famous Island Snow. Get the freshest seafood at one of the dozens of restaurants in charming Kailua Town - only 0.6 miles away from your very own tropical oasis. Join us in Kailua, where memories will be made and cherished for years to come. Booking Details: We require a 50% deposit through VRBO with a 3% administrative charge. All International Credit Cards (Canada included) will be charged an additional 2% fee. There is no smoking on site and maximum occupancy for this unit is two people. We offer discounted prices for guests who are able to fill in openings in our calendar that are coming up quickly. Please don't hesitate to ask!! Spa-like features and a hand-painted sink bring the Island life inside. A top of the line A/C wall unit in the bedroom. A shared laundry facility allows you to wash & dry while on vacation. We have bathroom and beach towels available for your stay. A round table seats 4 comfortably. 2 flat screen TV's are located in the unit. One in the living area and one in the bedroom. The backyard is beautifully landscaped with Hawaiian foliage and there are lounging chairs for suntanning. There are 3 bikes on the property that are shared between the units. A small lanai with 2 comfy reading chairs allows you to view the pool. A variety of snorkels and other gear is available and shared between the other units. The sparkling salt-water pool & spa is shared with 2 other units and the owner in the main house. Everything was perfect. The accommodation, the location but the piece de resistance was the quiet solitude of the tropical garden paradise with a small pool and hot tub. Comfortable luxurious garden loungers and a good read made for a relaxing few hours was a major part of our holiday. We had a great time! The place was perfect for two, immaculately kept, and had everything we needed to be comfortable and cruise into town. I highly recommend this unit. Lovely place, got off to a rocky start but all was resolved in a timely manner. Had a wonderful stay at this property, location to shopping and the beach is very convenient. Bed is comfy and felt very relaxed. Would be nice if the pool was warmer, however the hot tub is fantastic. 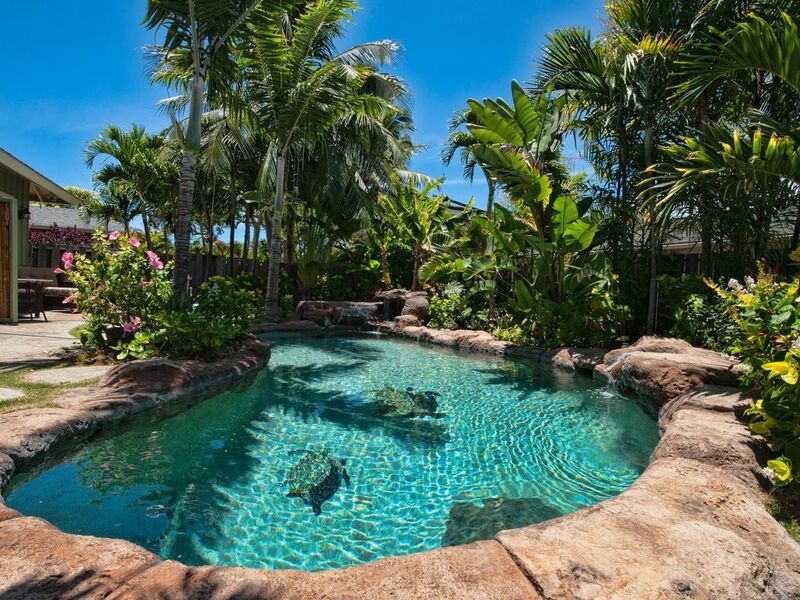 Truly a paradise in sweet Kailua. The garden is a gorgeous oasis, with a powerful jacuzzi spa to relax in. Spacious unit, with hand painted details by owner. She was available and helpful. 10 minutes to Kailua beach. Don't miss dinner at Buzz's. Wonderful. The owner is so nice and really wants your stay to be perfect. If we ever go back we will stay at the same place. Than you so much Debbie for staying with us! We are glad that you enjoyed your stay and we would love to host you the next time you are back in Kailua. Aloha! Stroll along the white sand of Lanikai Beach, named one of the top 10 beaches in the world by 2014 Travelers Choice! Only a 5 minute drive from our stunning property. We are situated on a picturesque, family-friendly road with little road noise and traffic. Breathtaking Kailua Beach is 0.8 miles away and will only take you 15 minutes to walk or 3 minutes to drive. Easy bicycle ride! Charming Kailua Town is also only a 12 minute walk away (0.6 miles) where you will find restaurants, shopping and grocery stores. Take a stroll through Whole Foods, try local flavors like Lilikoi, Mango and Pineapple on a shave ice from Island Snow or grab a coffee from Kalapawai Beach Cafe and walk the beach! You will discover lush, tranquil tropical gardens, a gorgeous lily pond complete with a waterfall and fragrant flowers on the property. The 10,000 square-foot property offers peace and quiet, making it the perfect refuge to come home to after a long day exploring the island. Unwind beside the sparkling salt-water pool and spa that boasts a waterfall. The unit features Hawaiian culture through stunning artwork and tropical décor with an island feel. There is a shared laundry facility on site and one off-street parking stall. We have bikes, beach chairs, boogie boards and other fun beach items available for our guests to use as well. We are here to offer you the best Hawaiian hospitality and assist you in having a wonderful relaxing time here in Kailua! Cancelation Policy: If you cancel more than 90 days prior to your arrival date, you will receive a full refund. If you cancel within 15 - 90 days prior to your arrival date, you will receive a 50% refund of the grand total. If you cancel within 14 days or less prior to your arrival, you will not receive a refund We offer heavily discounted prices for guests who are able to fill in last minute openings in our calendar. Please don't hesitate to ask! !